Google’s gone on a building spree with its productivity apps this week. The latest work comes to Google Keep, as the colorful note-taking service is inching closer toward being a full-blown competitor to apps like Evernote and OneNote. There are some new organizational capabilities and deeper ties to Android and Chrome. 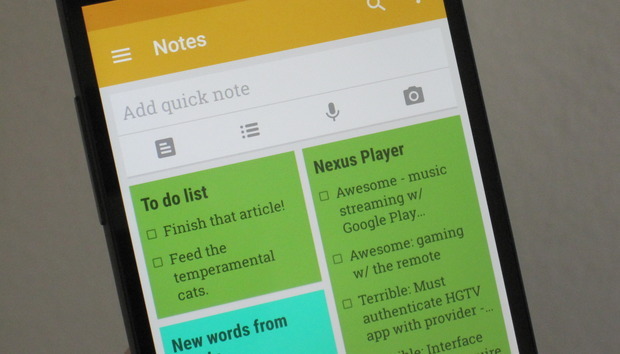 The impact on you: Google Keep is one of the best note-taking solutions for Android, particularly if you live your productive life inside of the company’s services. There’s been a lot of work on the productivity front lately, with new tricks for Inbox and a Save to Google extension, which all can help you save and work with more content from your Google account. The hashtag isn’t a typo: that’s what Google calls the category, which allows you to organize and search for groups of notes. With the new #Labels, you can better organize all your notes. Labels were already a thing with Keep, but the new hashtag system lets you create them from right inside the note (you’ll see auto-suggestions to existing categories) and then locate them from the app’s search bar. Google also moved around the buttons to add new content and then customize the notes to the bottom corners. The condensed toolbar speeds up organization. This location means no more reaching to the top of the screen, so they’re in direct reach of your thumbs now. Keep also gets deeper hooks into Chrome and the Android menu. On a mobile device, use the “Share via” window and then pick Keep to create a new note. You can then send over whatever content you had in the other apps, such as an image or web link. Save information to Keep using the Android intents menu. On the desktop, there’s a new Chrome extension for Keep. This way you can save a link, and add a few thoughts about it, into a new note inside of Keep. A new Chrome extension lets you add content right from the desktop browser. The new features are making their way through the Play Store, or you can grab the latest version now from APK Mirror.